The X-Box Design ™ of the Powerslide Triple X pure frame provides strength to the frame where needed, give enough flex and keeps the overall weight as low as possible. 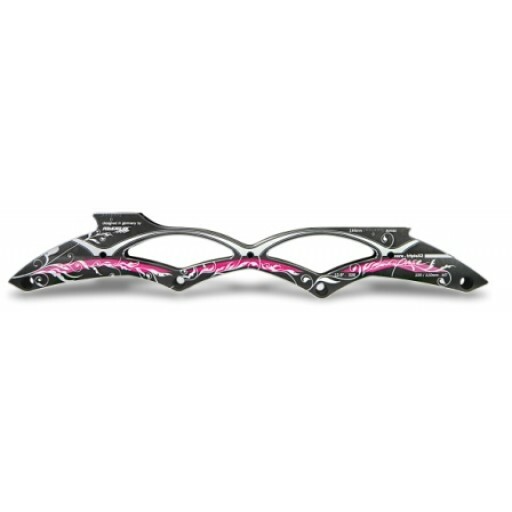 The Triple X2 pure offers at the front and back side more flex, and that's what lady skaters need. The X2 Triple frame owes the CNC milled and milled edges X in the side walls including the laser prints . Been extraordinary look One of the special features is the graduations along the side of the mounting points , they are placed on the front and rear pot in order to assist with the optimal adjustment of the frame. The Triple X pure frame has the standard 195mm mounting . The keywords for this premium performance frame are : X - tra stiff - X - tra light - X - tra fast. It comes with standard M7 single axles with torxkop with lazer prints. The torxkop has the advantage that it provides more grip than a normal socket, making it less fond turned. All frames of the Core collection have CNC machined recesses in the front and rear mounting block , for Pitch & Stride Control . The combination of the horizontal slot in the frame and longitudinal slot in the shoe together makes the X - lock assembly. This system provides the rider the ability to adjust the shoe without " dead spots " and so set it. According to his driving style and preferences frame ratio Extrusion . The X2 Triple frame has a unique X - extrusion . The integrated " X " is in all the three dimensions of the frame can be found , in the profile longitudinal direction , in the side walls , and also in the intermediate bridges . The "X" is known as a very strong construction . Обычная цена: 1 487,34 руб. Special Price 1 246,17 руб.